'Frederick' at the Chicago Children's Theatre + Tips for Your Trip! 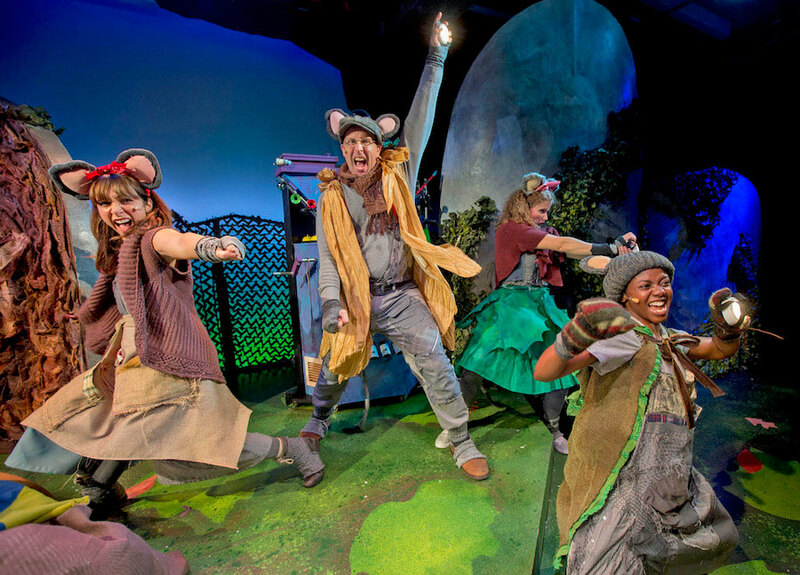 Chicago Children’s Theatre’s Frederick turns Leo Lionni’s classic picture book into an exuberant family musical. It’s the tale of Frederick, a field mouse too amazed by the world around him to worry about mundane things like collecting food for the winter . . . much to the chagrin of the other mice, especially nervous Nellie. And as winter closes in, the mice lose patience with Frederick, who’s too busy memorizing the colors of autumn leaves to lend a hand with the harvest. But in the darkest night of winter, it’s Frederick’s gift that gives the mice the joy they need to hold out for spring. Frederick is a charming, colorful show full of warmth and humor. Catch it in Chicago’s West Loop now through November 11! This all-ages show kicks off with folk-infused songs that had kids bopping along before the main event actually began. 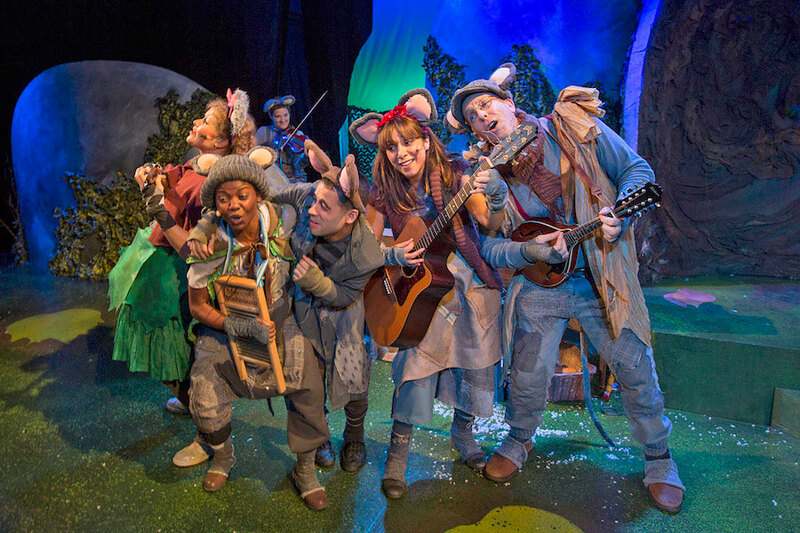 The talented cast is just as nimble on a wide range of instruments (including guitar, fiddle, piano, washboard, and a ‘banjo-lele’) as they are bringing their mousy characters to life. They skip, scramble, and squeak around the stage with spot-on comedic timing. Gorgeous lighting, funny sound effects, and organic set pieces that change with the seasons create enchanting scenes. The story celebrates the artists and poets among us — and kids will also resonate with Frederick, who can’t understand everyone else’s impatience when he’s too busy marveling at the wide world to pay attention to the task at hand. (Parents who hold back sighs as their toddlers demand to admire every leaf along the sidewalk will feel empathy for Nellie, too.) It’s an affirmation of our need for artists and dreamers, right alongside engineers and acorn-hoarders. 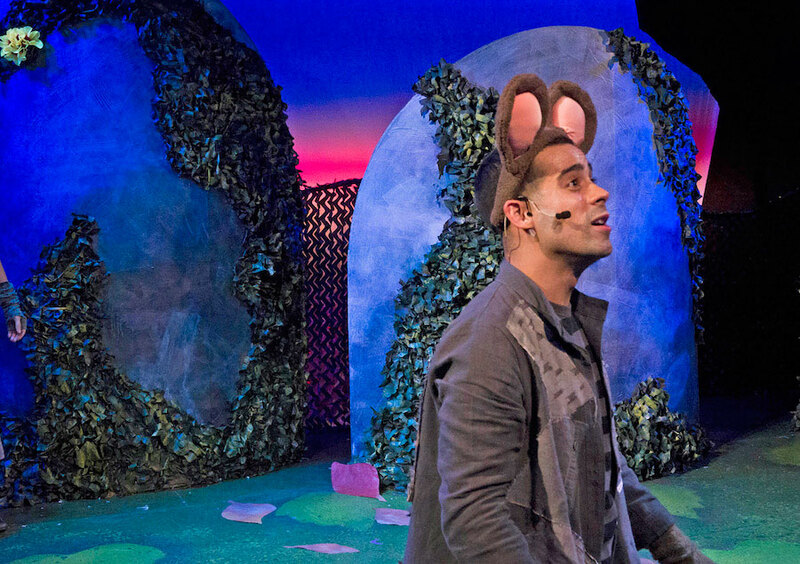 The real fun of the musical is seeing the performers take on their mousy personas, from Ernest, an inventor fond of ‘bells and whistles,’ down to Baby, a small mouse determined to be a big help (and who the kids couldn’t get enough of). The show is open to all ages, and I saw toddlers, preschoolers, and elementary schoolers alike enjoying the show. It is an hour long with no intermission, so use your judgment as to whether your two- or three-year-old is ready. My own just-turned-three-year-old seemed a bit awestruck by the entire production, but I saw children younger than him clapping and singing along. I think the younger elementary grades would love the show (and appreciate much of the humor), too. The Chicago Children’s Theatre at The Station is located in Chicago’s West Loop (just south of downtown), which is a pretty straightforward drive from the west and southwest suburbs. The building has its own free lot, and there are other free parking options nearby, too. To make a day of it, take the train downtown; it’s about a 20-minute walk from Union or Ogilvy, or a short trip on the CTA Blue Line. Inside the lobby, you can purchase Intelligentsia coffee, muffins, pretzels, and other snacks. Once you head into the auditorium, you’ll find low, cushy benches with a slight back that are great for families sitting together. After the show, explore Chicago’s vibrant West Loop neighborhood. My three-year-old and I headed over to Shake Shack for burgers (and grabbed Do-Rite Donuts from next door to bring home). You might also try out hot spots like Little Goat and Monteverde (which both top many Chicago ‘best-of’ lists for both adults and kids) or the ever-popular Lou Mitchell’s diner. Warm Belly Bakery, a gourmet cookie destination, stands kitty-corner from the theatre, too. Chicago Children’s Theatre does an amazing job of making theater available to everyone. Their ‘access weekend’ for Frederick is October 27 and 28, with events including a pre-show ‘touch tour’ where guests with low/no vision can explore the set; ASL and live open captioning; and a sensory-friendly performance with modified effects and a special quiet room. Frederick runs now through November 11; tickets are available at chicagochildrenstheatre.org or (312) 374-8835. General admission seating is $35; multi-show packages are available. Chicago Children’s Theatre is also hosting The Beatrix Potter Holiday Tea Party again this year; check out Jill Kowalksi’s review of last year’s festivities. Frederick is based on the book by Leo Lionni and adapted for stage by Suzanne Miller, with songs by Sarah Durkee and Paul Jacobs. It’s directed and choreographed by Tommy Raply, with music direction from Matthew Muñiz. See our Chicagoland Kids 2018-2019 Theater Guide for even more great performances! Be the first to comment on "‘Frederick’ at the Chicago Children’s Theatre Review + Tips for Your Trip"